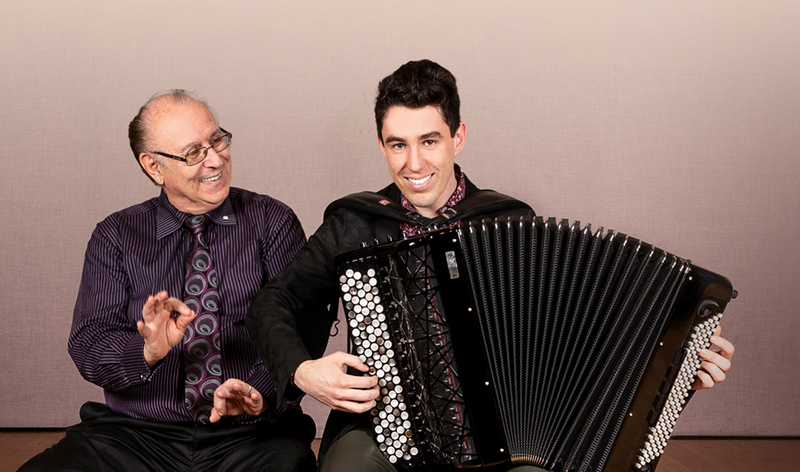 Accomplished accordionist Joseph Macerollo’s generous gift to the Faculty of Music supports a talented protégé. When Joseph Macerollo enrolled at U of T’s Faculty of Music in 1961, he was forced to study the piano—although he’d been a child prodigy on the accordion, his chosen instrument was barely on the radar. But by 1972, a few years after he had graduated with an MA in musicology, Macerollo was invited to set up an accordion program at the faculty. A half century later, Macerollo is at the other end of an exceptionally productive and storied career. In addition to teaching the instrument for decades at U of T, the Royal Conservatory and Queen’s University, he has toured the world as a soloist, written and performed music for film and television, and premiered dozens of works written especially for him. And now he has made yet another contribution to building a future for his instrument: a $100,000 gift to the Faculty of Music to endow the Joseph and Frances Macerollo Accordion Scholarship—the first such award in Canada. “I wanted to say thank you to the University for the opportunity, and for taking a risk all those years ago,” Macerollo says. Under his leadership, the U of T program is one of only a handful in the world that offer a doctorate in the instrument: Doctor of Musical Arts with Performance Emphasis on the Accordion. And fittingly, in the first two years of the scholarship, it’s been awarded to one of Macerollo’s DMA students, Michael Bridge, who’s in his eighth year at U of T and is working on his third degree. “Getting a scholarship in my professor’s name means a tremendous amount and is very inspiring,” says Bridge—these days known as U of T’s “Accordion Guy”. His doctoral work is focused on body-control techniques in accordion playing that his teacher pioneered, which brings the award full circle and ensures that Joseph Macerollo’s work will become even better known among accordionists around the world.